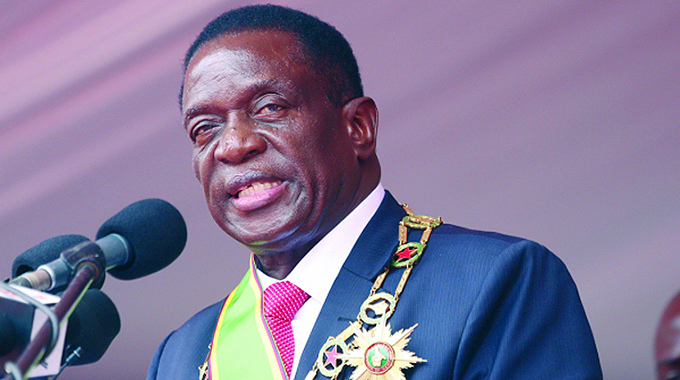 PRESIDENT Emmerson Mnangagwa has warned ZESA officials and their partners in the $1,5 billion Hwange Thermal Power Station expansion project to exercise the highest levels of financial discipline to ensure success. Further, the President called for hard work and team spirit so that the project is completed on time for the benefit of electricity consumers across the country’s economic sectors. President Mnangagwa said this while officiating during the ground-breaking ceremony Hwange Power Station units 7 and 8 expansion in the coal mining town on Wednesday. Infrastructure projects, the head of State said, of the magnitude of Hwange Thermal Power Station expansion require a lot of planning and good corporate management to ensure efficient, timely and cost effective implementation of the project. “I therefore, exhort ZESA, together with their partners and other local businesses that will participate in this project to be financially accountable, prudent and transparent during the course of the implementation of this project,” said President Mnangagwa. “I also urge all employees to exercise a good work ethic grounded on diligence, honesty, hard work, teamwork, unity and harmony. I challenge you all to make concerted efforts to complete this project on time or before time. Upon completion of the expansion of the Hwange Thermal Power Station, the power plant’s installed capacity is expected to rise to 1 520MW from the current 920MW, a move expected to guarantee adequate power supply in the country. President Mnangagwa’s call comes amid allegations that some public officials deliberately delay the progress of mainly high value projects so that they line their pockets, to the detriment of the nation. During former President Robert Mugabe’s reign, some top public officials were alleged to have deliberately delayed the progress towards implementation of several key public projects so that they lined their pockets at the expense of the country. Several tenders, including for the recapitalisation of the National Railways of Zimbabwe (NRZ), were frustrated by some alleged interested parties. After Government flexed its muscles in the Diaspora Infrastructure Development Group (DIDG) and Transnet of South Africa, the process to recapitalise NRZ to the tune of $400 million has begun in earnest and the previously wobbly company is showing signs of relief. The Hwange power project, which is being undertaken by Sinohydro Corporation of China, is expected to be completed in between 35 and 42 months. Sinohydro recently completed the expansion of Kariba South Hydro Power Station for an additional 300MW. Kariba South had an installed capacity of 750MW, which was extended to 1 050MW after expansion; over three and half years. Chinese firms are lauded across the world for their work ethic, which sees them completing most major projects within 42 months. Since the signing of the Engineering, Procurement and Construction (EPC) contract in October 2014, Sinohydro has since mobilised on-site and specialist engineers have conducted route surveys for the power line and site layout. It is understood that geotechnical and topological surveys, among a raft of other activities, have since been carried out ahead of the start of the project. Sinohydro is a Chinese state-owned firm founded in 1950. It is understood to be the world’s biggest hydro-power construction company with 50 percent equity of the global hydro-power market. The firm has aggressively pursued international dam-building opportunities and has been active in several parts of the world such as South East Asia, South Asia, Africa, Latin America and Eastern Europe. As at this month, the company has a market capitalisation of $15,2 billion. In the Hwange Thermal Power Station expansion project, Sinohydro is not only a contractor, but also an investor with 36 percent equity while the Zimbabwe Power Company (ZPC) holds 64 percent. ZPC is the power generating unit of ZESA Holdings.